An unclimbed peak in Nepal. 6,010 metres to the summit.17 days to do it. Longstanding supporter, Simon, tells us about summiting the previously unclimbed peak of Karbu Ri in the Nepalese Himalya for AfriKids. “Having previously ascended Kilimanjaro and undertaken a trek in Ethiopia with Expedition Wise, a first ever ascent of a mountain in Nepal advertised on their website proved irresistible. After the devastating earthquakes of 2015 the travel press was also emphasising the importance of tourism to the recovery of the region. As on previous treks I chose to use the challenge as an opportunity to raise funds for AfriKids, a brilliant charity which supports a variety of locally run initiatives in northern Ghana which I have personally been able to experience after a visit to the region with the charity. Others who signed up were raising money for Shelter Box Nepal and Junior Diabetes Research Fund. Everyone taking part funded their own cost of the expedition so everything raised will go directly to the charities. The Group, initially 13 people, departed from Heathrow on 5th November for Kathmandu. Our trek commenced close to the Tibet border at Chot Chot (1,377 m), reached after a gruelling 9 hour bus ride from Kathmandu, nearly half of which was on unmade roads. The ascent followed the Rowaling valley steadily upwards through the Sherpa villages of Beding and Na both of which were close to the epicentre of the second Nepal earthquake and suffered serious damage from rock falls. Other than by helicopter, access is only via the footpath we were following. It was therefore remarkable to see how much reconstruction had taken place with, according to local people, little assistance from the authorities. They were delighted to see us and the handful of other trekkers we encountered in the valley. Our accommodation was in tents which along with our kit bags were carried by a team of 27 local porters and three yaks. A team of four cooks under the guidance of a young Nepali chef ensured we received all the nutrition required for the ascent. Their ability to produce incredible meals under such challenging circumstances never ceased to amaze us! The challenge became very real as we climbed steeply out of the main valley into one of Nepal’s hidden valleys, ringed by 6,000m to 7,000m peaks and comprising entirely of glacial moraine over glacial ice. A day of stumbling over loose rocks brought us to Base Camp at 5,115 m followed by an entirely necessary rest day for acclimatisation. Sadly by this point two members of the team had had to be rescued by helicopter after suffering from severe altitude sickness. The conditions under foot were too difficult and the location too remote to allow for the normal cure of a rapid descent. The rest day also allowed us to take part in the Puja ceremony led by one of our senior Sherpas. This sought permission from the mountain gods to ‘spike’ the mountain with our crampons, ice axes etc and to ensure the safety of the expedition. Food and drink offerings were made and a paste smeared on our faces. Prayer flags were also erected which provide a colourful embodiment of the elements; blue symbolizing the sky and space; white for air and wind; red for fire; green for water; and yellow symbolizing earth. 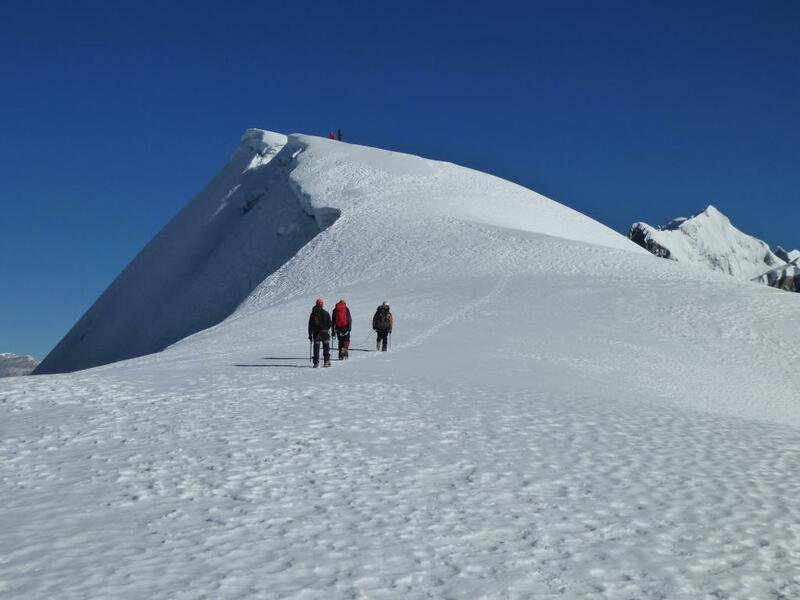 A trek to High Camp at 5,345 m followed, again over unpleasant glacial moraine, with the reward of a further rest day and spectacular views of the surrounding snow covered peaks. We were to spend four nights in this camp with temperatures dropping to close to – 20*C at night. 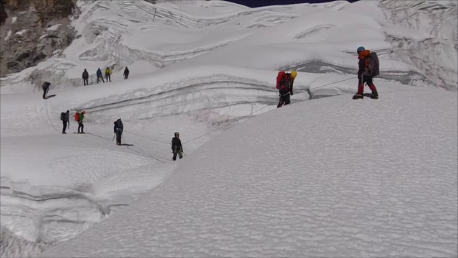 There was also the regular eerie sound of avalanches and rock falls on the surrounding peaks. The immediate route up from the camp involved an ascent up glacier ramps and steep moraine until the snow covered upper reaches of the glacier provided still steep but easier terrain. 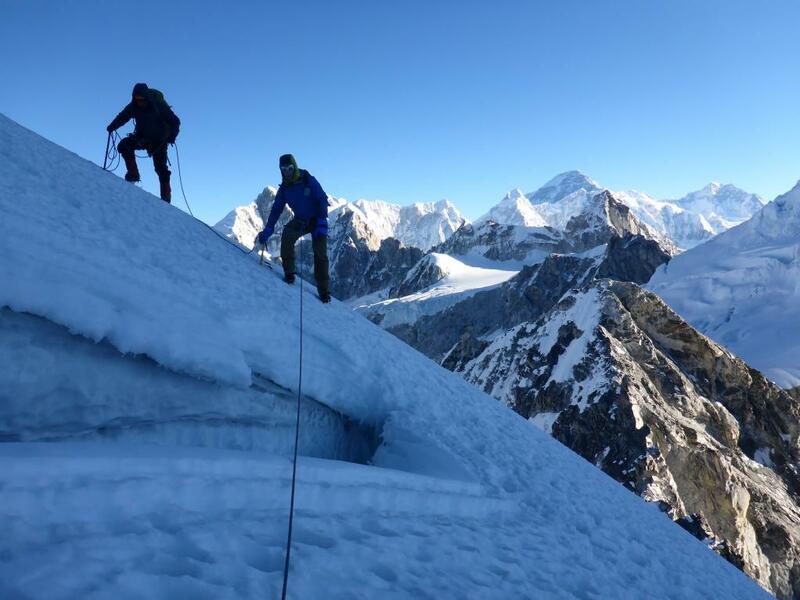 The Sherpas had installed considerable lengths of fixed line for our security and through the use of a Jumar, a form of hand held ratchet which slides up the rope and acts as a hand hold, facilitated our progress over the steepest sections. The whole team also wore full crampons and double boots, the latter being essential to avoid frost bite. Sadly at this point a third member of the team had to withdraw with altitude sickness and a further helicopter rescue was required. Our 2.00 am departure for the summit climb was in darkness but with some illumination from a full moon. The approaching dawn from about 5.30 am brought a gradual lightening enabling us to start appreciating the stunning surroundings being revealed and try to take in the fact that we were the first people ever to be climbing in this location. It also became clear that what we had thought was the summit from High Camp was the start of an approximately 1 km long ridge which continued to rise upwards, possibly reaching across the poorly defined border into Tibet. The summit was reached around 9.30 am. After days of looking up at seemingly inaccessible snowy peaks we were suddenly at a similar elevation and looking down into the desolate mountainous border region of Tibet. To our surprise we were also rewarded with a clear view of the west face of Everest. The full team at the summit! 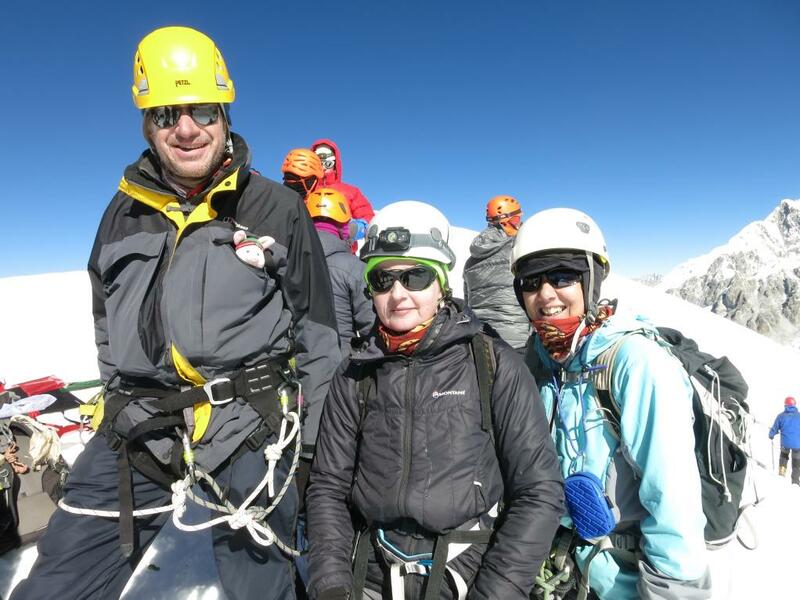 We were reminded throughout by our expedition leader, Brian Jackson, that most deaths occur during the descent of mountains, so we didn’t linger on the summit beyond setting up prayer flags and taking team photos. In full daylight it suddenly became apparent how steep sections of the ascent had been. Again the fixed lines provided security during the descent and the team returned safely but exhausted to High Camp around 3.30 pm just as the sun was dropping behind the ridge with the accompanying plummeting in temperature. As a second day had been allowed for an ascent in case of poor weather we were able to rest the following day and reflect on the previous day’s achievements. The trek out was effectively a retracing of our steps on the way up but with steadily increasing amounts of oxygen and heading downhill we were able to double up the days’ walks. We also chose to stay in three tea houses providing additional income to the local community. Accommodation is extremely basic but in all cases was clean. A celebratory dinner at the famous mountaineers’ restaurant, Rum Doodle, enabled us to mark our achievement on a ‘yeti foot’ alongside those of far more eminent mountaineers. The ascent will now be more formally recorded in the American Alpine Journal. 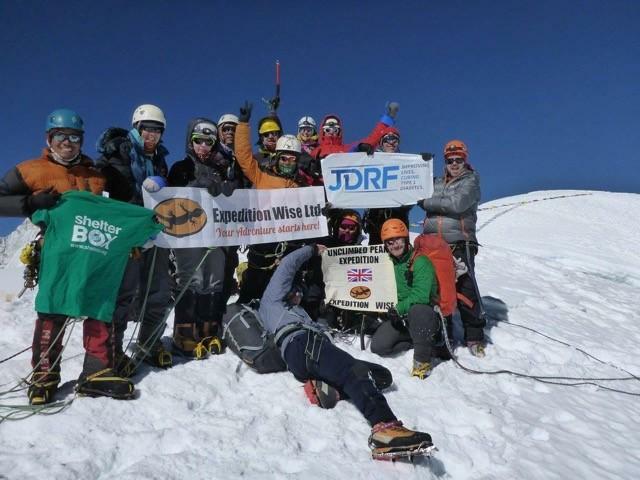 Expedition Wise have also referred the ascent to the Guinness Book of Records as it is believed that at 10 people we were the largest team ever to complete a first ascent in Nepal!